On Sunday, the Department of Ecology hosted a Nature Picnic. Families were encouraged to come out to Lincoln University with a picnic and participate in several activities. Kids could locate a target with a radio transmitter receiver, handle weta, smell the difference between a rhino and giraffe pooh, compare bite marks from different pest mammals, throw flax darts and much, much more. There were talks by Steve Wratten (on beneficial insects) and Tim Curran (on turtles and pythons) as well as a scavenger hunt and bike tour. Insects brought from home or captured during the day were identified by our handy-dandy experts. The weather was good enough and about a hundred kids and families spent several hours immersed in science. Mission accomplished! 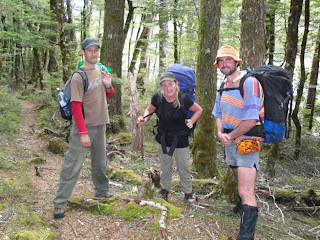 Our first batch of students are just finishing up their reports for ECOL 310 Field Ecology.The students spent a week at Hanmer Springs learning field techniques and then put them into practice in the Nina Valley, near Lewis Pass, for 5 days. Each student had their own research project. Here is a little taste (in their own words). Tim: Bird diversity in Nina Valley and the effects of two different pest control techniques on bird diversity. Bird presence and absence were recorded by doing five minute bird counts and recording along transect in areas where different techniques of pest control were being used. Results show that bird diversity was higher in the lower section of the valley where DOC200 traps were used. However, the distribution and abundance of birds may be affected by a number of variables, including spatial and temporal variability. 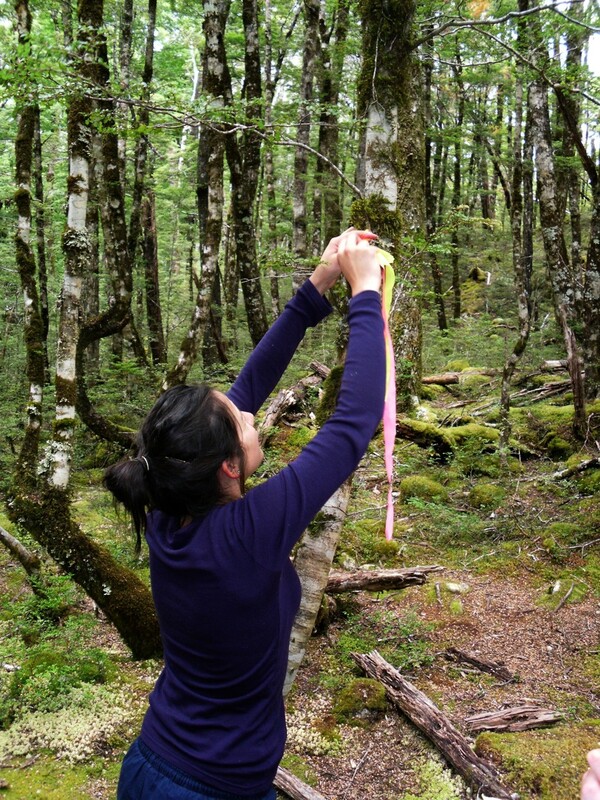 Jenny: The effect of microhabitat variation on the abundance and productivity of epiphytic Usnea lichens. My findings found a relationship with canopy cover and bark depth. Ruby: Bird richness and abundance in relation to habitat type in the Nina Valley. The habitats I compared were tall, dense forest; short, open forest; and grassland. My main findings were that neither bird richness or bird abundance differed significantly between these different habitats in the valley! 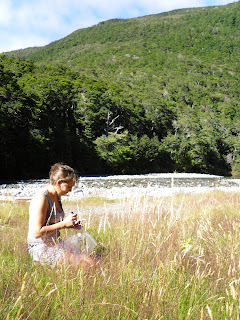 Hannah: Comparing leaf functional characteristics of native and exotic trees in Nina Valley and Hanmer Springs forests. I found phenotypic plasticity in the leaf thickness between mountain beech at Hanmer waterfall walk and Nina Valley. It is unlikely that invasive trees will establish at Nina Valley based on the leaf economic spectrum for leaf width and thickness. Denise: Mice (Mus musculus) Abundance in a Non-Masting Year in Beech Forest in the Nina Valley. Tracking cards baited with peanut butter were placed in 5 lines of permanent wooden tracking tunnels in the Nina Valley to determine mice abundance. In 2009, a beech mast year, monitoring of the tunnels showed a 100% presence of mice. This year (2012), a non-mast year, a 10% presence of mice was seen. Indicating that mouse abundance appears to be influenced by the beech mast. Jade: Species richness and life history traits of weeds in Nina Valley. 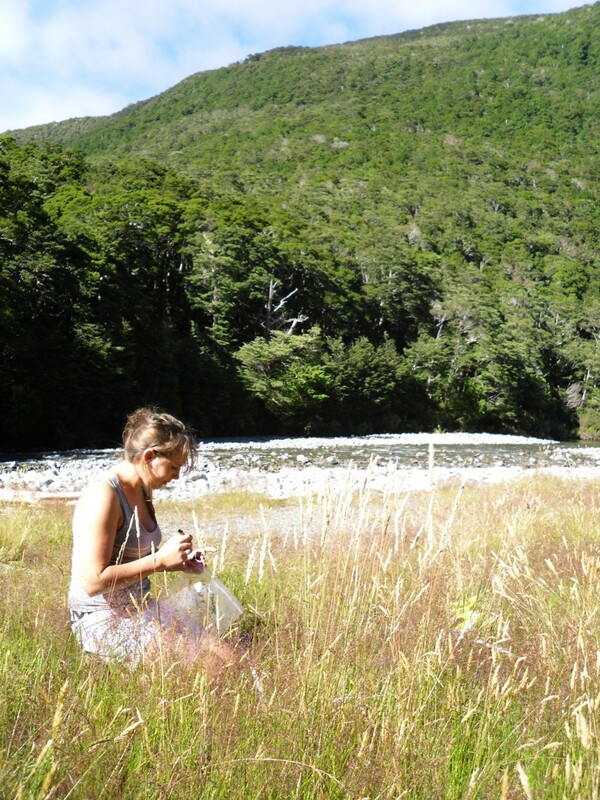 I studied the species richness of weeds at different sites up the Nina Valley to determine which exotic weed species had invaded and the life history traits that may have helped with their success. I found that weeds that were wind dispersed were more effective at colonising sites at higher altitudes, further away from the source site (The road). 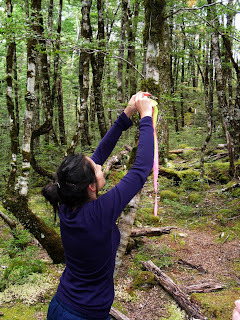 Lanah: The effect on tree fall gaps on Beech (Nothofagus) seedlings in two forest types present in nina valley, New Zealand'. Comparing seedling counts for Mountain (N. solandri var. cliffortioides), Silver (N. menziesii) and Red (N. fusca) Beech species, in areas disturbed by tree fall against areas that are not and also between the two forest types. Both sites are similar in altitude, topography and only 300 meters apart but provide distincly different environments for beech seedlings. 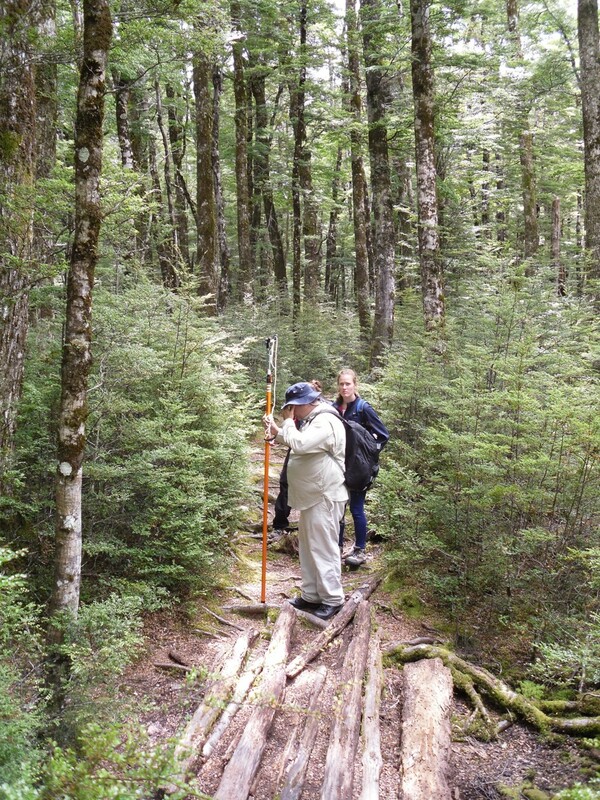 Site A) is damp, mostly shaded, has a thick and diverse understory; site B) is very dry, has minimal undergrowth and is completely dominated by Mountain Beech. I predicted that there would be an increase in all species of Beech seedlings from control to gap but results from samples were non significant and did not support my hypothesis. At the moment we are running the ECOL 310 Field Ecology course. Our third year students have spent a week in and around Hanmer Springs and the last week at Nina Valley, near Lewis Pass. 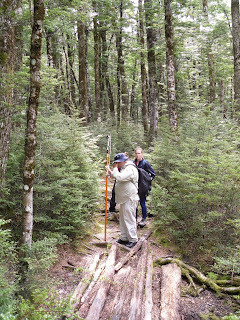 For the last few days they students have put in practice some of the skills that they have learned in a fantastic alpine beech forest. Projects have ranged from bird community structure to mammal pest activity at different altitudes to weed plant diversity up the valley, to lichen diversity among others. Students have been learning that the best laid plans can come unstuck when you are working in a challanging environment with significant hazards and logistical issues. Sampling is always easier when designing the protocol in the hut!